Cal Ripken 2001 MLB All-Star Game MVP commemorative cachet envelope produced by Photo File, postmarked in Seattle on the day of the game, autographed in blue marker by Ripken. 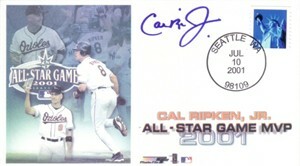 Authenticated by Ironclad (Cal's company) and MLB, with their numbered holograms on the back. With certificate of authenticity from AutographsForSale.com. MINT. ONLY ONE AVAILABLE FOR SALE.